Leonard Tsuguharu Foujita is recognized as being the "first Japanese artist to free that country's art of its legendary and classic image". Born in Japan, Foujita first studied at Tokyo's Imperial School of Fine Art. He achieved immediate and widespread recognition that included the purchase of one of his paintings by the Japanese Emperor. In 1912, he traveled to London and, the following year, to Paris, where immediately became associated with the central group of revolutionary artists that included Pablo Picasso, Georges Braque, Henri Rousseau and the Fauves who soon came to form his intimate circle. In 1917, he held his first exhibition in Paris, and by 1924, was exhibiting with the Fauves at the Salon d'Automne. That same year, he became an elected member of the Tokyo Academy of Fine Arts. In 1931, he embarked on a South American tour to publicize his work, achieving great success in Argentina and Mexico. He returned to Japan in 1940, and remained there until 1949 when he returned to settle in Paris. He became President of the Association of Japanese Artists and acquired French citizenship in 1955. 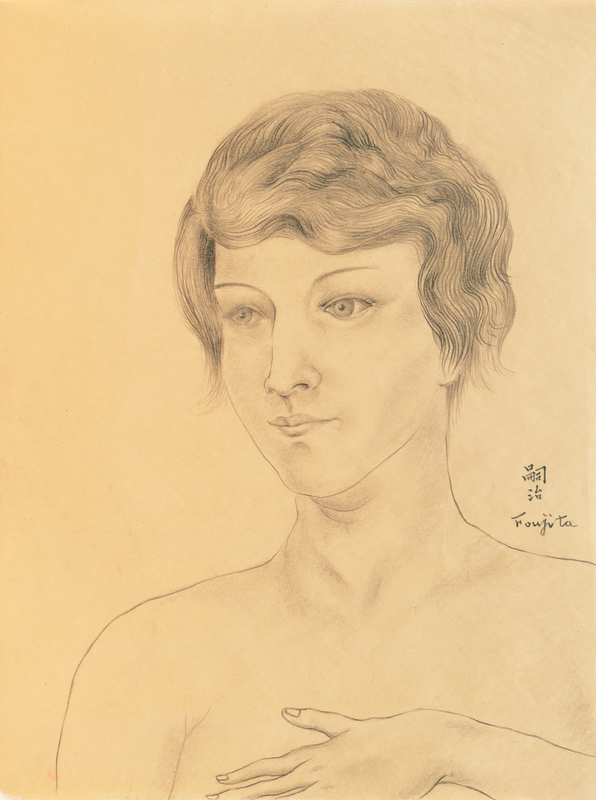 Foujita's painting style was primarily expressionist tinged with realism. After his conversion to Catholicism, he also painted devotional works including frescoes for the Chapel of Our Lady of Peace in Rheims. Among other public commissions were the decorations for the Japanese House at Cité Universitaire in Paris. Foujita's work may be found in the permanent collections of national museums world-wide including those of the Metropolitan Museum of Art in New York, the Musee National d'Art Moderne in Paris, the Petit-Palais in Geneva and the Los Angeles County Museum. Foujita is well-listed in all art-reference works, including Benezit, which includes a signature sample in his two-page entry. This work is accompanied by a first-edition copy of 'Foujita' by Jean Sels (Bonfini Press, 1981). Benezit, Dictionnaire des Peintres, Sculpteurs, Dessinateurs, et Graveurs, Vol. 5 p. 603-605; Thieme-Becker, Allgemeines Lexikon der Bildenden Kunstler, Vollmer Supplement, Vol. 2, p. 138; et. al.